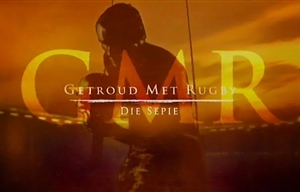 Getroud met Rugby: Die Sepie (Married to Rugby: The Soapie) is a South African soap opera based on the feature film and later drama series Gegroud met Rugby by Deon Opperman, which is set amongst a rugby-playing community. The drama series Getroud met Rugby was a kykNET success story, ending up one of the most popular series ever offered by the channel. Consequently kykNET commissioned series creator and producer Deon Opperman to turn the show into a soap that retains all the elements of the drama series, but also meet the requirements of a good soap opera: entertainment for the whole family. Popular characters from the drama series return along with a whole new team of characters, including an entire family consisting of father, mother and four children aged 16 to 24; as well as three new married couples. Actors from the drama series making the transition to the soapie include Altus Theart, Louis van Niekerk, Rina Nienaber, Johan Scholtz, Franci Swanepoel, Nadia Beukes, David Clatworthy, Marijke van der Westhuizen and Anlia van Rensburg. New characters are played by Jocelyn Broderick, David Vlok, Sean Noordwyk, Arno Greeff, Ilse-Lee van Niekerk, Werner Coetser, David Louw, Christel van den Bergh, Vaughn Lucas, Jolene Martin, Fezile Mpela, Stephanie Baartman and Elsje Slabbert. Based on an original concept by Deon Opperman and Hanli Rolfes. The producer is Deon Opperman and the executive producer is Soné Combrinck.